The all new Micromax Canvas Nitro A310 is the forth Octa-core smartphone from Micromax supports Dual-SIM(GSM+SMG) with dual-standby, Bluetooth, Wi-fi and 3G comes with a bigger 5-inch HD (720×1280 pixel) IPS display with an oleophobic coating runs on latest Android 4.4 kitkat OS and 1.7GHz octa-core MediaTek MT6592 processor promising superior muti-tasking. Canvas Nitro also offers you 2GB RAM, 8GB internal memory which further expandable up to 32GB via MicroSD card while for shooting New Nitro combines a huge 13-MP primary camera with Sony IMX135 CMOS sensor, Largan 5P Lens, with Schott Blue Glass filter and F2.2 aperture, Rear wide angle of 28mm and a 5-MP secondary camera with BSI Fixed Focus with OV5648 Sensor and F2.4 aperture, 22m wide-angle lens with 75-degree viewing scope. It’s also packed with a powerful 2500mAh battery promising up to 10 hours of talk time, up to 320 hours of standby time, web browsing up to 5 hours(3G) and up to 10 hour 42 min* on 2G including 28 hours Music playback time. Sensor accelerometer, ambient light, and proximity sensor. 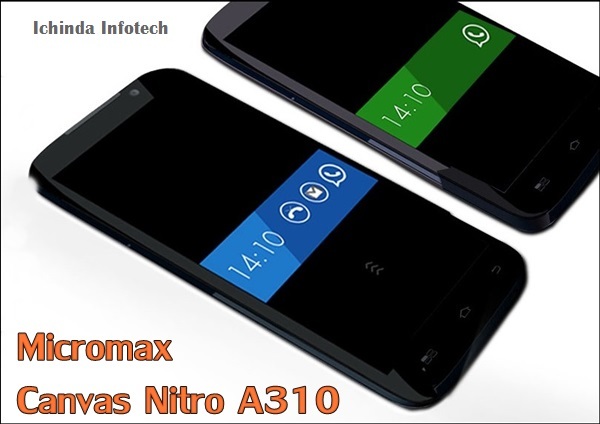 At last few honest word, the all new new Micromax Canvas Nitro A310 is going to rock the Indian market. What you think? Please be open to give your view.